Walking off the shuttle bus, it feels like I’m stepping into another dimension, where psychedelic colored John Lennon glasses are on every face and sherpa-lined jean jackets keep guys and girls warm. I’ve walked into the Shabang zone. It’s a blustery Saturday afternoon but that doesn’t stop the show. I arrive just as Rowan McGuire is setting up onstage. He’s a singer-songwriter from San Luis Obispo who harmonizes with the strum of his acoustic guitar. NATURE: Having Shabang at Laguna Lake Park lent itself to the unique experience of being surrounded by the lake and trees while sitting in the wild weeds. As he begins singing “Whispers of the Night,” more and more people make their way to the wild weed-filled spots on the ground as the sun is finally peeking through the clouds. “Whispers of the night, hold me tightly, under the waters of demise, as the current shifts just slightly, I can almost taste the blue skies,” McGuire sings. While the sun is beating down, the bitter wind is still blowing around long locks of hair. As everyone finds a spot on the ground, it’s almost as if they’re all lost in the elbow-high weeds of their own worlds. 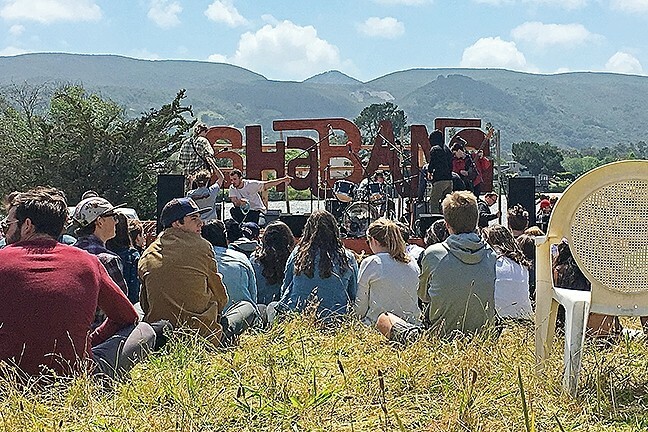 This local music festival started on top of a mountain in San Luis Obispo, with just a couple of friends hearing about the word-of-mouth show. Eight years later The Last Shabang, as it was then called, is now just Shabang and has no end in sight. Bands set up in front of the wood-cut letters that spell out the event—with the background of the rippling waters of Laguna Lake—while eager concertgoers try to creep closer to the stage. Pancho and the Wizards take the stage, drawing the beginnings of a big crowd. I’m on the dividing line between the kids ready to jump into the mosh pit and those wary of being tossed around. As the music picks up the pace, so does the friendly shoving, jumping around, and laughing. A guy is brave enough to surf the crowd on top of all that, and as I grab my phone to snap a picture of the moment, I realize that I’m the only one. I think back to what I’ve seen walking around the event. I remember groups of friends and couples, but the cellphones are missing. Going to a music festival often means countless pictures of outfits, music sets, and poses in front of art that tell your social media world that you were there, that you experienced Coachella, Electric Daisy Carnival, Lightning in a Bottle, or Burning Man. WELCOME : To keep tabs on the next Shabang festival, get your hand on some sweet merchandise, or learn more about the event, visit shabangslo.com. Maybe it’s because this is a more intimate setting or because people really care about experiencing the music and each other in the moment. In the back of the crowd, people are talking, having a cold beer, lying on blankets, and excitedly running into old friends. There are a couple of booths: jewelry, art, first aid, and pizza from Woodstock's. But it’s really about music-goers coming together, sharing the experience, and genuinely having a good time. This was my first time at Shabang, but it definitely won’t be my last. Karen Garcia is enjoying a cold brew in the grass at kgarcia@newtimesslo.com.